Now more than ever, churches play diverse and crucial roles in their communities. As the need for guidance and leadership grows, churches have become more than spiritual refuges. Along with expanding responsibilities comes the need for more funding to ensure that they are adequately equipped to carry out mounting missions and developing duties. Without question, times are financially tough. It’s no great surprise, then, that people are giving less money to churches and charities, even as these institutions require it now more than ever. It’s also no great surprise that James D. Klote & Associates, Inc., a fund-raising consultancy leader, is finding its services so greatly in demand. As the man behind the name, Jim Klote has a long and impressive resume in the fund-raising arena. Klote got his start in 1987 working for Detroit’s United Way. He subsequently went on to work for the country’s first fund-raising firm, Ward, Dreshman & Reinhardt, Inc. (WD&R), garnering the distinction of becoming that firm’s youngest director and also its youngest president. 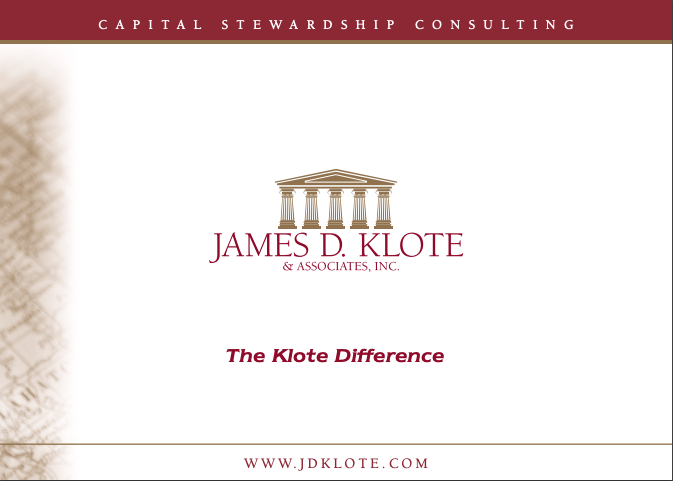 Klote then went on to create and lead James D. Klote & Associates, Inc. a Falls Church, Virginia-based consultancy that focuses exclusively on capital stewardship for churches. The company is fused with St. Charles, Illinois-based WD&R, which is its wholly-owned subsidiary. WD&R concentrates its own fund-raising efforts on behalf of schools and other non-profit organizations. Ranked No. 1 in the country in guiding churches through the process of attaining campaign success to support their respective goals, James D. Klote & Associates is totally hands on. The staff is always present and completely committed to every single project. These features make this standout firm unique, since the majority of others in the industry only offer part-time fund-raising services. “We are happy to have the distinct niche of being full time fund-raisers.” Klote explains, “Our employees actually go to the fund-raising site, live there and become a part of the on-site staff while working on the project. We experience the day-to-day workings and get to know the church leaders and volunteers. We truly become a part of the community.” The firm is comprised of stellar directors who are dedicated and who all share a deep personal commitment to helping churches accomplish the missions of their ministries. With its services always in need and holding the distinction of being the nation’s premier fund-raising firm for churches, the firm has chosen to be selective in the projects it takes on. “I am always looking for a good match. As much as a client is interviewing our firm, I am assessing their interest in doing things the way we know they should be done to be successful. We want to work with those who will let us guide and lead. They have hired us for our counsel and we want to ensure that we will be partners in the campaign. We educate and uncover potential leaders and committed volunteers in a client’s plan of campaign. We conduct campaigns at the highest moral, ethical and professional level, whether it is for a one-time building campaign or repeat fund-raising event,” Klote shared. Making sure all of the company’s operations are running smoothly and efficiently is Erin West, Vice President of Operations. West came to Klote & Associates following an impressive career as an event and marketing coordinator in the competitive Washington, D.C. market. The talents that helped her succeed in her former profession (being organized, interacting with people and spearheading marketing campaigns) helped her seamlessly become a welcome and important part of Klote. Among the many hats West wears are overseeing the massive and crucial direct mailings, drawing up specialized and personal contracts for clients, creating a company manual and making sure the right people are working on the right campaigns. “It is so important that our employees are a good fit with our clients,” West maintains. The company engages twice a year in the mailing of some 6,000 pieces, each of which are hand signed by Klote, hand stamped and followed up by a personal email from Klote. As daunting as that sounds, it’s all part of the job West loves and finds so satisfying.”The work we do here is rewarding on so many levels. We make a difference. Not many people get to experience that,” West stresses. According to West, the firm makes its clients successful by ensuring that at the time of the kick-off event, the public phase announcing the project, approximately fifty percent of the goal is already secured through pledges and gifts. This is done by engaging the leadership of the church. The more than 300 recommendations received are proof of Klote and his firm’s expertise. Goals for the future include demanding even higher levels of customer satisfaction and focusing on growth. “We are expanding into Canada and will be opening an office in Toronto, Ontario. We also have our sights on opening a West Coast office. For me personally, I will focus more on sales and marketing. My name is on the letterhead and people expect to see me at conventions, focus group meetings and conferences and I am glad to make my presence at these events. I really don’t like just sitting in the office,” Klote adds. 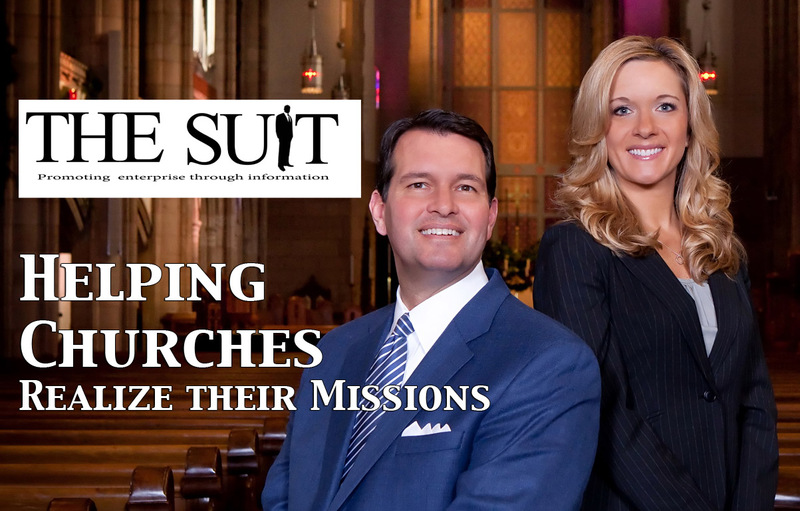 With church funding needs presently becoming greater than ever, so are their needs for the services of James D. Klote & Associates, Inc.